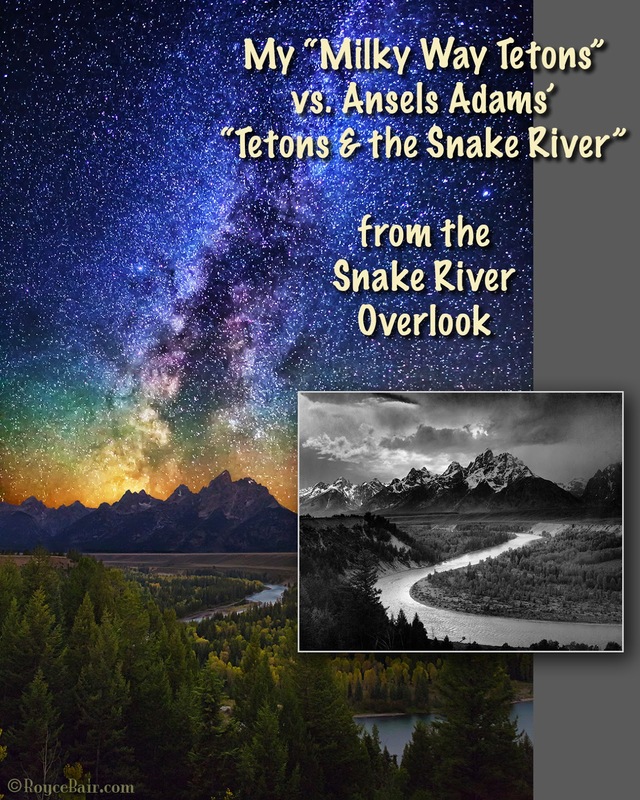 This alignment of the Milky Way over the Grand Tetons, from the Snake River Overlook, required me to wait until mid-September. I waited until mid-September so the Milk Way would align with the Grand Teton peak, which faces almost due West from the Snake River Overlook. 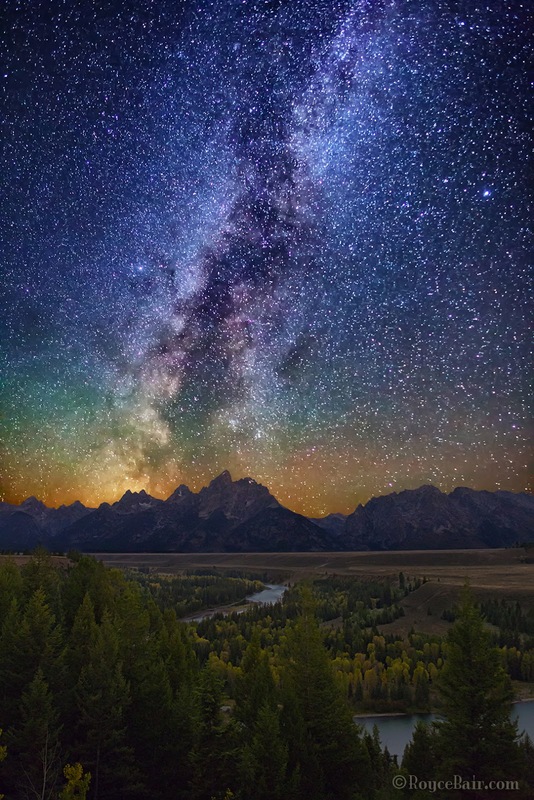 Although the bright core of the Milky Way is just below the horizon, “The Great Rift” (where the MW splits and forms the “Sea of Darkness”) rises dramatically over the Tetons. It was taken with my Canon 5D Mark III, using a Rokinon 24mm f/1.4 @ f/2 • 13 sec • ISO 6400 for the sky. I blended the sky exposure with a second exposure for the foreground @ f/2.8 for 240 sec • ISO 3200 (using the camera’s “Long Exposure Noise Reduction” function). 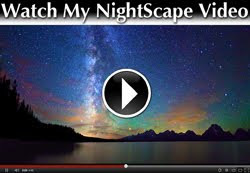 Planning your Milky Way alignment: I was required to wait until September in order to align the Milky Way with the Tetons. Although the core of the Milky Way moves nightly from East to West at about 15º per hour, the seasonal movement adds another 30º per month —moving the MW almost 150 degrees to the West, going from April to September. You can forecast your alignment using apps like Photopills and SkyGuide. 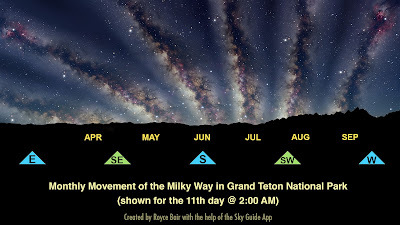 In the above chart I’ve taken six Milky Way images from the Sky Guide app, all captured at 2:00am on the same day of each month (the time and date I ended up taking the top photo) and pasted them into one composite photo to illustrate the monthly movement of the Milky Way; and, I’ve added a real silhouette of the Teton Range on the West side to show the actual perspective from the Snake River Overlook. 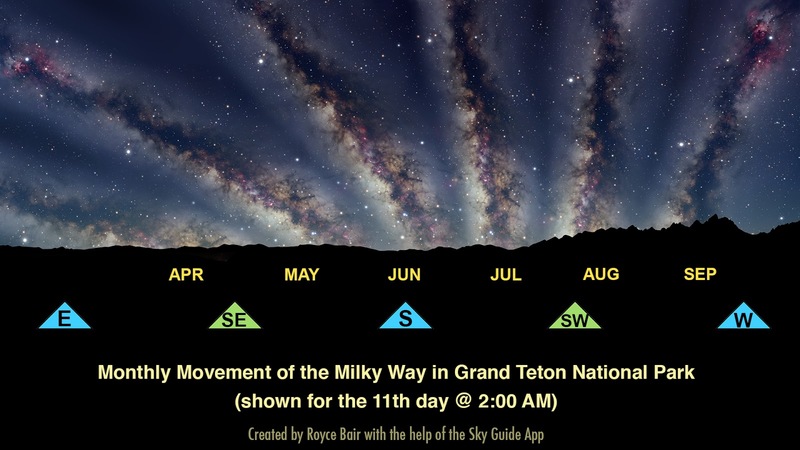 Using this illustration, it's easy to see how the seasons not only affect the westerly move of the Milky Way, but the height the Central Bulge, as it rises above or sinks below the horizon. Tree Trimming Needed? Despite all my planning and the impact of the Milky Way, my photo lacks the beautiful snow pack that disappears from the mountains by August. But even more noticeable is the growth of the trees that has occurred since Adams took his photograph in 1941. This new grow has obscured much of the Snake River. Some Grand Teton park visitors have wondered if the park should trim these trees similar to what is being done in Yosemite. Under Yosemite’s “Scenic Vista Management Plan” young trees are being removed that block the historic views that John Muir and Ansel Adams rhapsodized about when they first saw Yosemite in the nineteenth and early twentieth centuries. What’s your opinion? Wow you're great artist! Your photos are great.